^ Among versions of the Principia online: . ^ 2.0 2.1 Volume 1 of the 1729 English translation is available as an online scan; limited parts of the 1729 translation (misidentified as based on the 1687 edition) have also been transcribed online. ^ J M Steele, University of Toronto, (review online from Canadian Association of Physicists) 互联网档案馆的存檔，存档日期2010-04-01. 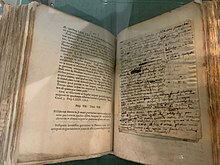 of N Guicciardini's "Reading the Principia: The Debate on Newton’s Mathematical Methods for Natural Philosophy from 1687 to 1736" (Cambridge UP, 1999), a book which also states (summary before title page) that the "Principia" "is considered one of the masterpieces in the history of science". ^ (in French) Alexis Clairaut, "Du systeme du monde, dans les principes de la gravitation universelle", in "Histoires (& Memoires) de l'Academie Royale des Sciences" for 1745 (published 1749), at p.329 (according to a note on p.329, Clairaut's paper was read at a session of November 1747). ^ G E Smith, "Newton's Philosophiae Naturalis Principia Mathematica", The Stanford Encyclopedia of Philosophy (Winter 2008 Edition), E N Zalta (ed.). ^ 7.0 7.1 The content of infinitesimal calculus in the 'Principia' was recognized both in Newton's lifetime and later, among others by the Marquis de l'Hospital, whose 1696 book "Analyse des infiniment petits" (Infinitesimal analysis) stated in its preface, about the 'Principia', that 'nearly all of it is of this calculus' ('lequel est presque tout de ce calcul'). See also D T Whiteside (1970), "The mathematical principles underlying Newton's Principia Mathematica", Journal for the History of Astronomy, vol.1 (1970), 116-138, especially at p.120. ^ 8.0 8.1 Or "frame" no hypotheses (as traditionally translated at vol.2, p.392, in the 1729 English version). ^ From Motte's translation of 1729 (at 3rd page of Author's Preface); and see also J. W. Herivel, The background to Newton's "Principia", Oxford University Press, 1965. ^ Online 'Principia', 1729 translation, at page 19 of vol.1 (1729). ^ This relationship between circular curvature, speed and radial force, now often known as Huygens' formula, was independently found by Newton (in the 1660s) and by Huygens in the 1650s: the conclusion was published (without proof) by Huygens in 1673.This was given by Isaac Newton through his Inverse Square Law. ^ Eric J Aiton, The Cartesian vortex theory, chapter 11 in Planetary astronomy from the Renaissance to the rise of astrophysics, Part A: Tycho Brahe to Newton, eds. R Taton & C Wilson, Cambridge (Cambridge University press) 1989; at pp.207-221. ^ See Curtis Wilson, "The Newtonian achievement in astronomy", pages 233-274 in R Taton & C Wilson (eds) (1989) The General History of Astronomy, Volume, 2A', at page 233). ^ Newton's position is seen to go beyond literal Copernican heliocentrism practically to the modern position in regard to the solar system barycenter. ^ See online 'Principia' (1729 translation) vol.2, Books 2 & 3, starting at page 387 of volume 2 (1729). ^ Edelglass et al., Matter and Mind, ISBN 0-940262-45-2, p. 54. ^ See online 'Principia' (1729 translation) vol.2, Books 2 & 3, at page 392 of volume 2 (1729). ^ Snobelen, Stephen. The General Scholium to Isaac Newton's Principia mathematica. [2008-05-31]. （原始内容存档于2008-06-08）. ^ Ducheyne, Steffen. The General Scholium: Some notes on Newton’s published and unpublished endeavours, Lias: Sources and Documents Relating to the Early Modern History of Ideas, vol. 33, n° 2, pp. 223-274. (PDF). [2008-11-19]. ^ D T Whiteside, "The pre-history of the 'Principia' from 1664 to 1686", Notes and Records of the Royal Society of London, 45 (1991), pages 11-61; especially at 13-20. ^ See J. Bruce Brackenridge, "The key to Newton's dynamics: the Kepler problem and the Principia", (University of California Press, 1995), especially at pages 20-21. ^ See page 10 in D T Whiteside, "Before the Principia: the maturing of Newton's thoughts on dynamical astronomy, 1664-1684", Journal for the History of Astronomy, i (1970), pages 5-19. ^ The Correspondence of Isaac Newton, vol.4, Cambridge University Press 1967, at pp.519, n.2. ^ The Correspondence of Isaac Newton, vol.4, Cambridge University press 1967, at p.42. ^ I Bernard Cohen, Introduction to the Principia, Cambridge 1971. ^ Richard S. Westfall. Never at Rest: A Biography of Isaac Newton. Cambridge U. Press. 1980 ISBN 0-521-23143-4, at p.699. ^ The Correspondence of Isaac Newton, vol.4, Cambridge University press 1967, at pp.518-20. ^ The Correspondence of Isaac Newton, vol.5, Cambridge University press 1975. Bentley's letter to Newton of October 1709 (at p.7-8) describes Cotes' perhaps unenviable position in relation to his master Bentley: "You need not be so shy of giving Mr. Cotes too much trouble: he has more esteem for you, and obligations to you, than to think that trouble too grievous: but however he does it at my Orders, to whom he owes more than that." ^ "Translating Newton's 'Principia': The Marquise du Châtelet's Revisions and Additions for a French Audience." Author(s): Judith P. Zinsser Source: Notes and Records of the Royal Society of London, Vol. 55, No. 2 (May, 2001), pp. 227-245. ^ I Bernard Cohen (1968), "Introduction" (at page i) to (facsimile) reprint of 1729 English translation of Newton's "Principia" (London (1968), Dawsons of Pall Mall). ^ See pages 29-37 in I. Bernard Cohen (1999), "A Guide to Newton's Principia", published as an introduction to "Isaac Newton: The Principia, Mathematical principles of natural philosophy, a new translation" by I Bernard Cohen and Anne Whitman, University of California Press, 1999. ^ "Isaac Newton: The Principia, Mathematical principles of natural philosophy, a new translation" by I Bernard Cohen and Anne Whitman, preceded by "A Guide to Newton's Principia" by I Bernard Cohen, University of California Press, 1999, ISBN 978-0-520-08816-0, ISBN 978-0-520-08817-7. Babson College Archives & Special Collections 三个不同版本(1687年版, 1713年版, 1726年版). 1729: Newton's 'Principia', first English translation, vol.1 with Book 1.